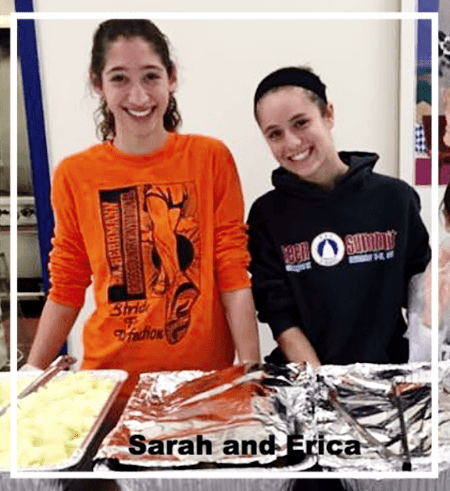 We are pleased to introduce two young women, Erica and Sarah, who have taken on the role of coordinating volunteers for The Sister Maureen Joyce Center Soup Kitchen at 369 Livingston Ave. in Albany, New York the third Sunday of every month. A longtime coordinator had just stepped down from her role, and the local faith based organization needed to ensure that the soup kitchen in downtown Albany had volunteers. They soon learned that organizing other volunteers was a big responsibility, and much more work than just volunteering themselves. Scheduling is a challenge—finding people willing to commit several months in advance is difficult. The coordinators developed a simple and engaging role description (with smiley face emojis), and sent targeted e-mails to recruit extra hands. Perhaps most remarkable is that these two volunteer coordinators are only high school sophomores! “We took over this role because we wondered what would happen and how the people would continue to get their meals if they didn’t have someone to coordinate the volunteers,” said Erica. Once the volunteers get on site at the soup kitchen, the impact is incredibly clear. “The majority of the time is spent cooking the meal,” said Sarah. “We then serve the meal and spend some time cleaning up. We weren’t sure what to expect at first, but we enjoyed it. Erica and Sarah have hearts of good. Thank you for inspiring other students and adults by making a measurable difference! To contact Erica and Sarah about possible volunteer opportunities please email them at CBEsoupkitchen@gmail.com.